Wow...we have had a busy few days. So busy, in fact, that I have been unable to write a blog post. But, our group has made it safely to Jerusalem and we are enjoying our time together. Friday's stops included Capernaum, a boat ride on the Sea of Galilee, Nof Ginnosar, and an opportunity to step into the sea. We were able to have lunch at a local restaurant to have "St. Peter's Fish". We ended our day by climbing to the top of Mount Arbel and viewing the entire Sea of Galilee. It was a wonderful day. This morning, we left the serenity of the area of Galilee and headed toward Jerusalem. On the way we made stops at Jezreel, Spring of Harod, Bet She'an, Jericho, and the baptismal site. Our arrival in Jerusalem was met with much cooler temperatures than what we experienced to our north. It was a welcome relief. Not only is the group doing great, but they are an absolute joy to be around. Tomorrow, we head towards the Dead Sea. This evening, we arrived in the beautiful city of Jerusalem. Unlike what is being reported on the news right now, it is exactly as I remember it from my last visit. In fact, when we arrived at Jericho today, it was more crowded with tourists than I have ever seen it. So, whatever is being reported back home isn't exactly what is happening here on the ground. In other words, as much as we all appreciate your care and concern, we are doing just fine. I always hate leaving Galilee, but that is what we were required to do to keep on our schedule. Very soon, we found ourselves at Tel Jezreel, the site of the palace so Ahab and Jezebel. From the hillside, you can see the locations of many Biblical stories. Shortly thereafter, we arrived at the Spring of Harod. Gideon narrowed his army to 300 men by giving them a test here. The water was actually flowing a little bit. Since we are at the end of the dry season, I had not expected this. A visit to Bet She'an was next on the agenda. The amount of ruins that are visible here is overwhelming. By claiming to the top of the tel, you get a good appreciation for the strategic importance of this location. By driving down the Jordan Rift Valley, we found ourselves at Jericho. Whenever we stop there, I want to talk to the group for an hour discussing all that happened here. But, it was very hot when we arrived. So, I abbreviated my comments and then finished them up when we were all back in our touring coach. After a quick visit to the traditional baptismal site, we made our way "up to Jerusalem". We will spend the next five nights here and enjoy all of the sites in this wonderful city. We are all having a great time and the sarcasm is getting more and more intense. I can't wait to spend time with all of them again tomorrow. Sometimes people ask me, "Why do you study Biblical geography so much?" Generally, I study Biblical geography because it helps me to understand the Bible more. But, to answer answer the question specifically, I can think of three reasons. I will cover these three reasons in the next few posts. Reason #1 - I study Biblical Geography to better understand God's people. God wanted His people to teach their children about Him as they walked by the way (or, as they walked across the land). Three times a year, the nation of Israel were required to go to Jerusalem for the feasts. As they made those trips, it would provide a number of opportunities for the parents to talk to their kids about God. As they passed the Spring of Harod, the could explain how God used Gideon and a small army of only 300 men to take on and defeat the Midianites. As they passed Mount Carmel, they could explain how God and Elijah took on the prophets of Baal and proved that He was the one and only true God. As they passed the ruins of Jericho, they could explain how God used His power to render a fortified city defenseless against His people. By studying Biblical Geography, we can better understand God's people and how they taught their children. In my next two posts, I'll discuss two other reasons why we need to study Biblical geography. In a previous post, I made reference that the words in the Bible mean something. By carefully reading all of the words, a clearer understanding of Scripture can be found. I was recently teaching a class on the book of Joshua in which we were discussing Israel's preparations for attacking the city of Ai in Joshua 7. The passage in question involves a conversation between Joshua and member of his army. This conversation took place in Gilgal, in an area on the floor of the Jordan Rift Valley near Jericho. Notice the language that the men use in describing the location of Ai in reference to where they currently are located. The picture at the top of this post is from BiblePlaces.com. It is an aerial picture south of Jericho looking north. Be sure to notice the dramatic elevation change from the city of Jericho as the terrain rises into the Central Mountain range. Now, go back and read the passage again. As you can tell, Joshua and his men described the situation perfectly from their point of view. Words truly do mean something. Don't skip over them when reading these Biblical stories. As I speak to people about the lands of the Bible, I am often met with surprise when I discuss the rich and fertile areas of Israel. And, while there are places like the wilderness and the Negeb that are very dry, much of the area is well watered. Recently, I watched a video by Amir Aloni of the Jordan Valley. He took the footage for the video using a drone which flew over many of the fields in the area. I encourage you to watch it as well. When I saw this video, I was reminded the passage in Genesis 13 in which Lot chose to settle in the fertile Jordan Valley when he separated from Abraham. A year ago today, we went to the lowest place on earth, the Dead Sea. This beautiful body of water does not live up to its name...it exceeds it. The water in the Dead Sea is a beautiful shade of blue and is actually quite clear for several feet. We began the day by driving down to Masada, where Herod built a beautiful palace. Years later, nearly a thousand Jewish zealots held off the Roman army for a couple of years by using this "stronghold". Our next stop was at En Gedi, for a short walk up a path to a waterfall. It is interesting to see the abundance of water in this place given the arid environment around it. It is no wonder why David fled to this location while being pursued by Saul. After a stop at Qumran (where the Dead Sea Scrolls were found), we visited one of the oldest cities in the world, Jericho. You can visualize so many Biblical stories from this location. We finished our day by trying to take a dip in the Dead Sea. Of course, everyone just floated to the top. But, it was a great day to end the day. Tomorrow: We visit the Old City. [soundcloud url="https://api.soundcloud.com/tracks/191530415" params="auto_play=false&hide_related=false&show_comments=true&show_user=true&show_reposts=false&visual=true" width="100%" height="450" iframe="true" /] The Israelites had survived Pharoah chasing them toward the Red Sea. They had spent time at Mount Sinai. They had survived forty years of wandering in the wilderness. But before they could begin their conquest of the Promised Land, they had one more barrier to cross...the Jordan River. How did this happen? Joshua 3 tells us this incredible story. And that is what we will be discussing on today's program. Note: If you are reading this post in an email, you can visit the Podcast page on the Exploring Bible Lands website to listen to the podcast. [soundcloud url="https://api.soundcloud.com/tracks/186283773" params="auto_play=false&hide_related=false&show_comments=true&show_user=true&show_reposts=false&visual=true" width="100%" height="300" iframe="true" /] In 1 Samuel 12, as Samuel is growing old, he takes the time to address the nation of Israel one last time. At the end of his speech, he asks God for a sign. God then sends a thunderstorm. The text then tells us that the people "greatly feared the Lord and Samuel". Why? Well, to fully understand the answer to the question, you need to know a little bit about the geography of Israel. That is what we will discuss in today's program. You can subscribe to this podcast by searching for "Exploring Bible Lands" in iTunes, or by using our podcast feed URL (http://feeds.soundcloud.com/users/soundcloud:users:132866789/sounds.rss) in any podcast subscription application. The Mount of Temptation fringes the Judean Wilderness just north of the Dead Sea, where it looms over the site of Jericho (Tel es-Sultan). Because tradition states that, following His baptism, Jesus ascended this mountain to be tempted, a beautiful, gravity-defying monastery has been built on the mountainside. Above this is the fortress some believe to be Ptolemy’s hideaway, Dagon, mentioned by Josephus—though others conjecture this may be a later Crusader structure. In 1 Samuel 12, Samuel speaks to the people of Israel about some of the decisions that they have made, primarily concerning the fact that they had requested a king (when God was already their king). However, he states that if the people and their king will obey the Lord, then all will be well. However, if they don’t, then “the hand of the Lord will be against you and your king”. Then, Samuel performs a sign. He asks God for thunder and rain. And, the Lord provides it. Why did the people “greatly fear” them? Well, you have to know a little bit about the geography and climatology of the land to understand. Location of the Sign The people were assembled at Gilgal. (NOTE: I realize that there are a couple of different locations attributed to Gilgal. And, I realize that “a gilgal” could have been something that was built. But, I believe that in this passage we are talking about an actual location). Gilgal was location approximately 4-5 kilometers away from Jericho in the base of the Jordan Rift Valley. As winds come off of the Mediterranean Sea, they reach the Central Mountain Range and rise. As the air rises, it cools and water droplets condense and eventually fall as rain. Therefore, the Central Mountain Range (including the cities of Jerusalem, Bethlehem, Samaria, etc) get about 26 inches of rain per year. However, as the winds top of the Central Mountain Range, they descend into the Jordan Rift Valley. In doing so, the air warms and the water dries up. Consequently, the city of Jericho (which is located about 10-12 miles from Jerusalem) only gets 4-6 inches of rain per year. So, why were the people afraid? Because they realized that God made it rain in a place that doesn’t get that much rain. But, I think that there is another reason. Time of the Sign Did you catch that extra piece of information that Samuel stated in his speech? He said that it was the time of the wheat harvest. What does that mean? Well, the little rain that does fall in the Jordan Rift Valley falls between the months of October and April. The wheat harvest is in May (and may go into June). The people knew that God had made it rain at a time of year in which it never rains. When the people saw that the rain fell in a place that rarely gets rain and at a time in which it never gets rain, they knew that this was a sign from God. And consequently, they were greatly afraid. By better understanding the lands of the Bible, you can better understand the stories in the Bible. Recently, I presented a lesson on this topic at Capshaw church of Christ. You are welcome to listen to it and let me know if you have any questions. Today was spent the entire day around the lowest place on the earth, the Dead Sea. After breakfast, we headed toward Masada. Our goal was to beat the crowds and the heat of the day. We arrived around 9:15 and went to the top. This is a great stop. This site is one of the top tourist attractions in Israel. From a Biblical perspective, it is interesting to see the lifestyle of King Herod and knowing that it was this man's family that was the ruling party in the First Century. Our next stop was En Gedi, which included a brief hike up to a waterfall. During David's life, he went to En Gedi and after visiting the site, you know why. In the middle of the Wilderness of Judea, it was this location that had water. Even today, water continually flows from the mountains as it makes its way to the Dead Sea. Traveling north up the coast, we found ourselves at Qumran, the site where the Dead Sea Scrolls were found. We enjoyed learning about the Essenes and their lifestyle in this arid climate. Our next stop was at the traditional baptismal site of Jesus. The Bible tells us that John the Baptist was baptizing at "Bethany beyond the Jordan", which means that John was baptizing at some location on the other side of the Jordan from where we were located. Due to various reasons, the River Jordan is very small through here. It is only about 20 feet wide and about 2 feet deep. In many ways, it is very depressing. However, the Israelis, Palestinians and Jordanians are all working on this problem. Jericho was next on our list. This site is very special for me because so many Biblical sites took place here. We discussed many of these events as well as the architectural finds that have been made here. Having a smaller group (about 30) has its advantages. We were able to squeeze some extra time in our schedule to take everyone to the Qumran kibbutz and allow them the opportunity to float in the Dead Sea. And, they did! This verse follows the account of Jesus' interaction with Zacchaeus in Jericho. It is only 13 words long and simply says that he went "up to Jerusalem". Although the passage doesn't mention how he went up, we can probably safely assume that he walked. He walked to Jerusalem. The elevation of Jerusalem is around 2500 feet ABOVE sea level. The elevation of Jericho is around 800 feet BELOW sea level. The distance between the two cities is about 12-14 miles (depending on the exact path that you took). This picture was taken in late April, which is a little after the time of year of which this passage is written. The latter rainy season has ended, so there is nothing but clear skies. 14 miles. Uphill. In the direct sunlight. He walked. And, of course, He knew that He was walking to his death. Knowing the land of the Bible helps you understand the Bible. Perhaps in later posts, I'll talk about more paths that were walked in the Bible. NOTE: This is the third post of a series in which we are discussing some of the locations where the Ark of the Covenant was present. We've discussed the Plains of Moab and the Jordan River. After the Israelites entered the Promised Land, they set out to fulfill the commandment that God had given to them. They needed to drive out and destroy all of the inhabitants of the land of Canaan. In doing so, God would be with them and deliver the land to them. The Israelites put their sights on Jericho. Jericho is located about 10 kilometers (6 miles) west of the Jordan River at an elevation of about 260 meters (850 feet) below sea level. 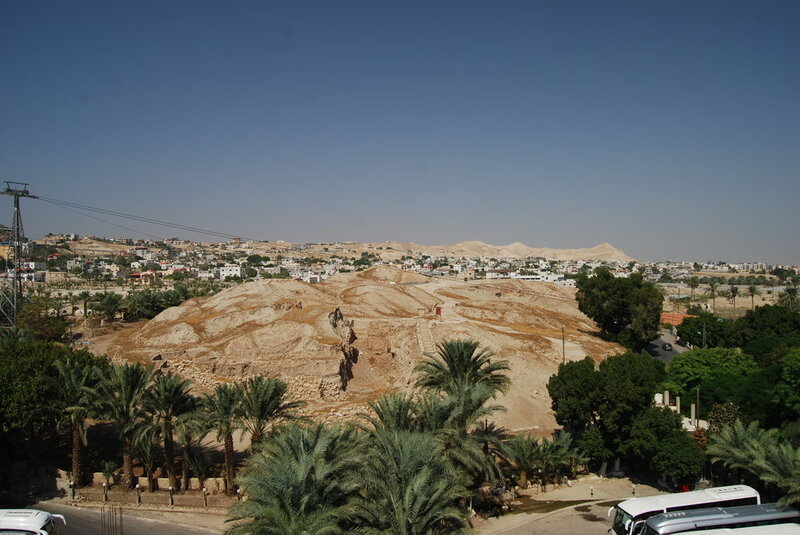 Because of the warm tropical conditions, King Herod built a large palace in Jericho. The city is only about 15 miles from Jerusalem, but it is over 3000 feet lower in elevation. And due to the geography, Jericho only receives about one-fourth of the annual rainfall as Jerusalem. At the time of the conquest, Jericho was a fortified city surrounded by a casemate wall. The harlot Rahab had a house on this wall. For six days, the Israelites carried the Ark of the Covenant from Gilgal (where they were encamped) and walked around the city of Jericho. On the seventh day, the Ark of the Covenant led them around the city of Jericho seven times. After which, they blew their trumpets and the walls of the city were breached. It was a glorious victory for God and His people. When the Israelites were encamped at Mount Sinai, God gave instructions to build a gold-plated, wooden box. This box became known as the Ark of the Covenant and it remained in the possession of the Israelites for hundreds of years. They carried the Ark before them and it led them into battle. I thought that it would be interesting to take a look at some of the places where the Ark resided and discuss them in a series of posts. After wandering in the wilderness for 40 years, the Israelites approached the land of Canaan from the east and temporarily settled in the Plains of Moab. Moses ascended to the top of Mount Nebo where God showed him the land that was being given to the nation of Israel. After Moses died, the Israelites stayed in the Plains of Moab while they mourned his death. The plains of Moab stretched north-to-south along the eastern side of the Jordan River, opposite from the city of Jericho. The land is rather flat and ranges from 5-10 miles wide before rising dramatically into what we commonly call the Trans-Jordan plateau. A majority of it lies below sea level, but despite the arid climate, crops and agriculture flourish. Later, we recognize this location as the same area where Elijah was taken into Heaven in a whirlwind. In New Testament times, this was part of what we know as Perea. The location of Bethany beyond the Jordan was also in this same area. Most of the time, when we think of Biblical Adam, we think about the first man. However, did you know that there is a location in the Bible called "Adam"? It is mentioned only one time, and God used that location to demonstrate his power and help deliver His promise to His people. Do you remember where you read about it? If you can't remember, don't feel too bad. I've only recently remembered while it while doing some personal study. You can read about it and see it on a map here. Today was spent in an around the Dead Sea in the Wilderness of Judea. We had a surprise visit this morning at Qasr al-Yahud, which is near the traditional location of the baptism of Jesus. In the Gospels, we read that John was baptizing at "Bethany beyond the Jordan". So, John was actually baptizing at a location on the other side of the Jordan River. However, this is as close as we can get without going into the country of Jordan. Due to irrigation and water control, the river at this point is very narrow compared to what it was in Biblical times. We then traveled down to the vacation home of Herod the Great, Masada. 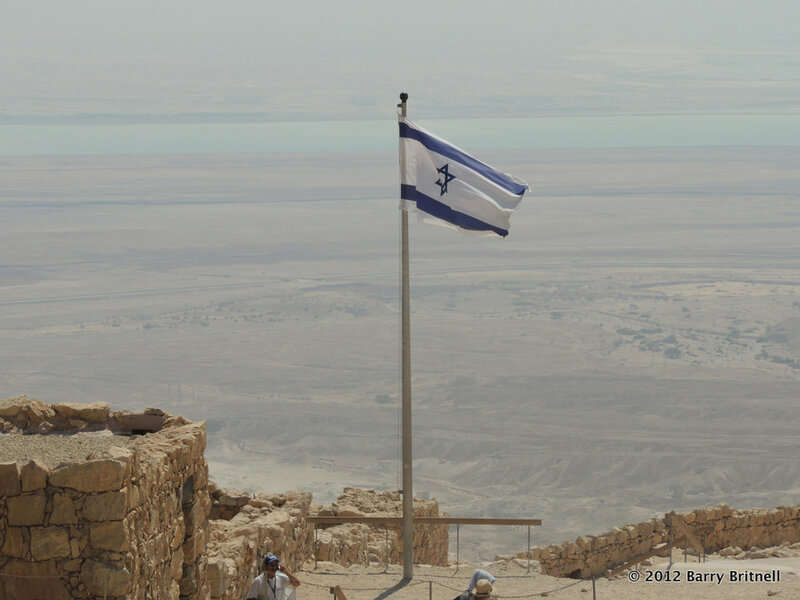 The history of Masada is something that every person should study. Consequently, I won't go into that now and leave that to your personal study. Masada is never mentioned by name in the Bible, however it might have been referenced. The word "masada" means fortress. While in the area, the scriptures mention that David visited a fortress on three different occasions. In addition, David mentions a fortress in four of his psalms. So, it is highly possible that David visited here. I had one other interesting experience at Masada, which I'll discuss later. From there, we traveled north for a brief stop at En Gedi (where David hid while he was being pursued by Saul), Qumran (the location of the discovery of the Dead Sea Scrolls) and Jericho. I've been to Jericho twice and it is one of the highlights of my trip. The tel that we visit is from Old Testament Jericho (New Testament Jericho was in a slightly different location). From that tel, you can see the size of the city, so you know exactly how far the Israelites marched as they circled the city for seven days. You can also envision Rahab, who built her house on the wall of the city. She could look out her window and see the Israelites as the encamped in the plains of Moab across the Jordan River. It is a fascinating place. Tomorrow is an early day. We have to leave the hotel at 7:00am in order to be in the Old City in time to enter the Temple Mount by 7:30. So, I'll need to get to bed soon. When Tabatha and I went to Israel in 2010, we took over 1300 pictures and several hours of video. Of all of the pictures that we took, I believe my favorite picture is the one shown at right. (You can click on the picture for a larger version.) I took this picture early in the morning while standing on the northeastern shore of the Dead Sea. For those of you who are thinking about this, you have probably picked up on the fact that if I took this picture from the northeastern shore of the Dead Sea, then I was not, in fact, in Israel. And, for that, you would be correct. I was actually in the country of Jordan when this picture was taken. Good thinking. But, I am facing northwest into Israel. In the foreground, you see the beautiful waters of the Dead Sea. (And, yes...the waters in the Dead Sea are beautiful. In fact, the water is much clearer than you would expect. Perhaps I'll blog more about that later.) Just offshore, you see the modern city of Jericho. The ancient cities of Jericho (Old Testament and New Testament) are located within the modern city limits. And, if you look closely at the top of the ridge, you can see the eastern edge of Jerusalem and the surrounding cities. The distance from Jericho to Jerusalem is approximately 24 kilometers (15 miles) with an elevation gain of over 1000 meters (3400 feet). When I saw this picture, I was reminded of two stories in the Bible. Then Jesus answered and said: “A certain man went down from Jerusalem to Jericho, and fell among thieves, who stripped him of his clothing, wounded him, and departed, leaving him half dead." What is interesting is that Jesus didn't go into any details about the road between those two cities. Those listening to Jesus knew all about that road. They knew that the road was no place for someone to be walking all alone. And, very little has changed about that road in 2000 years. As you can tell, once you leave the Jerusalem area, you are on your own until you reach Jericho. It was the perfect setting for Jesus to use to tell his story. When He had said this, He went on ahead, going up to Jerusalem. Isn't the accuracy of the Bible amazing? He went "up to Jerusalem". Look again at the picture. Of course He did. Understanding the Bible lands helps you to understand the Bible stories even more. I wonder what my favorite picture will be from this trip? Stay tuned.